Kindergarten and first-grade writing skills give children a strong academic foundation. Children often show a flurry of development in writing skills from kindergarten to first grade. Many students enter kindergarten with only a rudimentary understanding of basic writing skills. By the time they start first grade, however, they should have a strong foundation for both reading and writing, and by the end of first grade, they should be able to write basic sentences and paragraphs on their own. Every child is different, and some children develop writing skills more quickly than others, but a strong writing curriculum in both kindergarten and first grade can help maximize your child's potential. Reading and writing skills are inextricably linked, and children who read well typically have fewer problems with writing. 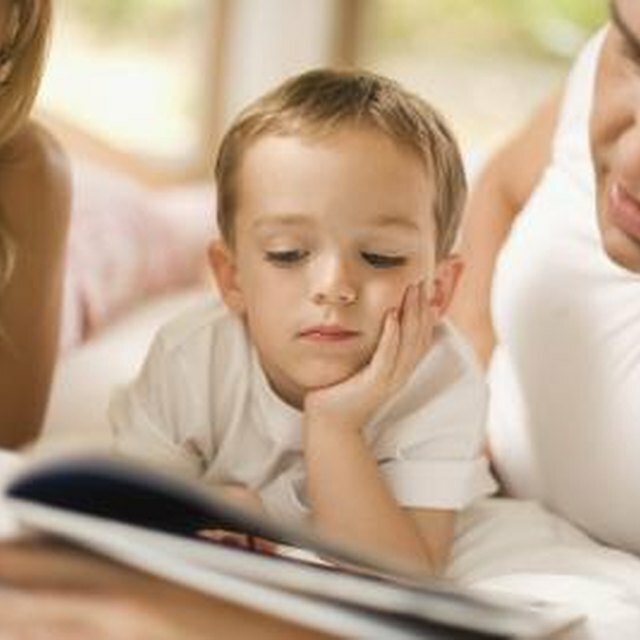 In kindergarten, your child will likely spend a lot of time on basic reading skills. Read to her daily, and encourage her to read along with you. Most children begin to recognize a few words in kindergarten and by first grade have many words memorized and can sound out many more. As children learn to read more words, they learn basic spelling skills. Further, regular reading helps children understand the basics of sentence structure and grammar -- two key components of writing. 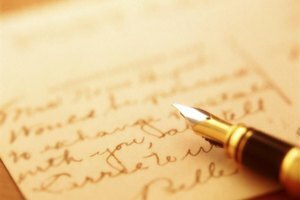 Storytelling skills play a critical role in writing development. Kindergarten curricula often center around teaching children the elements of a good story. Children may create story boards, illustrate stories or be encouraged to tell stories to their classmates. 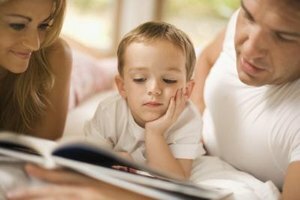 In first grade, children develop an even stronger grasp of the basics of storytelling and are generally able to write very brief stories with a basic plot. 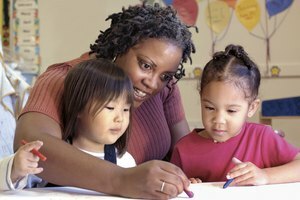 First-grade teachers often work to help children master the basics of storytelling by giving brief creative-writing assignments and asking children questions about stories they have read. 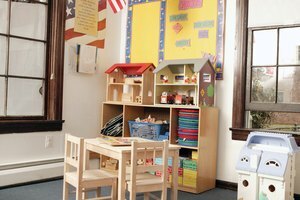 The use of learning centers is common in both kindergarten and first grade. Various workstations in the classroom may be dedicated to listening to book recordings, drawing pictures of book characters, letter-writing and independent reading. Forming letters is one of the first steps toward independent writing. In kindergarten, children first learn that letters make sounds that form words and then learn to draw letters. By first grade, children's letters tend to be more uniform in shape and size, and teachers may begin working with children on handwriting. 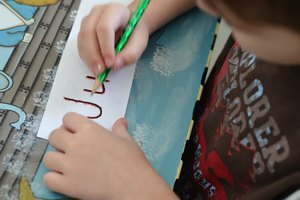 Children begin to master not just letter formation, but also writing words, and they can often write words at a relatively fast pace by the end of first grade. In kindergarten, teachers focus heavily on helping students understand the correlation between letters, words and books and enabling students to form letters. In first grade, however, writing skills become more structured. Students may receive formal instruction on the writing process -- prewriting, drafting, revising, editing and publishing. Teachers also work to help students understand the various goals of writing, such as conveying information and sharing a story. Many first-grade teachers encourage students to keep a journal or have weekly in-class journal-writing sessions. Thompson, Van. "What Is Expected in Writing Skills From Kindergarten to First Grade?" Synonym, https://classroom.synonym.com/expected-writing-skills-kindergarten-first-grade-7711.html. 26 September 2017.